Here's a good way to save your "smoke break" at the office. 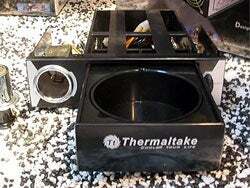 The Thermaltake Cigarette Lighter and Beverage Tray offers a built in lighter and cup holder for even the most discriminate desktop workstation. Now that smoking is a crime in most public buildings, this device makes even more sense for the conscientious employee who wants to make sure they pollute the lungs of everyone else in the office. In the next version they should really outfit the cup holder with a built in breathalyzer so that you can be sure not to show up drunk at office meetings.